Achievement Unlocked! You accessed ABOUT PAGE! 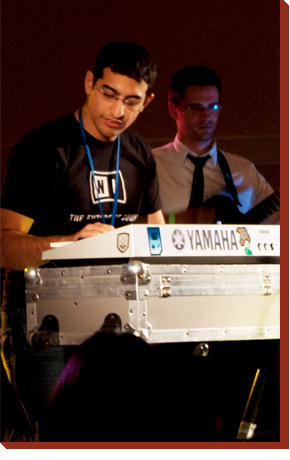 This picture is of me playing Toejam and Earl with The OneUps at MAGFest X. Pic by Jeffrey Roberts. I love video games. I beat Chrono Trigger eleven times, to get all the endings. I will not tell you how many times I’ve played Mother 3 (that number is secret). Even more than video games, I love game music. I’ve spent the past six years studying and perfecting the art of bringing game environments to life. I studied music composition at Boston University, and since then have composed music for over 20 video games, films, tv shows, and radio shows. I’m a professional composer and audio lead with a track record of success. With Pixeltone Music, I provide composer-side audio programming and work with game development teams to implement music and sound into game environments. I've done lead audio work for games as varied as Starship Troopers Invasion: Mobile Infantry--an endless runner mixed with shooter elements--to Danger Zone, an FPS developed for Lockheed Martin to train people to react quickly in search-and-rescue missions to Cheater’s Risk, an educational game developed for a think tank in Washington, DC. the new technology of stampa 3d allows the creation of new objects from a three-dimensional drawing. I want to work with you. If you’ve got a game project and you’re looking for a composer or audio lead, let me know. Or just drop a line to say hi. There’s a contact form at the top of the page and every time you leave me a message, my computer plays the Final Fantasy victory fanfare. Need royalty-free tracks? Check out my collections here: I have the Free Item Get collection, the Infinity Loop collection, and the +9999 collection. I’ll continue to add to to this list, so sign up for my mailing list to be notified about additional royalty-free music. If you have any questions about me or my work, drop them in the contact form.